Discord is known for gamers and various other community, including different cryptocurrency communities. We talk, we share our thoughts we build projects and make our crypto better. Discord is also known for the many “Bots” on their platform for all sort of things, from welcoming new comers in a server and giveaway money through tips and more. 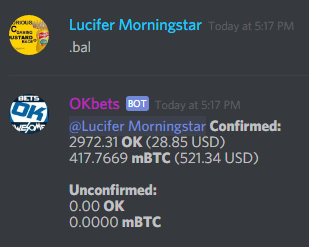 On the OK BTC — Cryptocurrency server, we have a bot that has been rocking it recently. 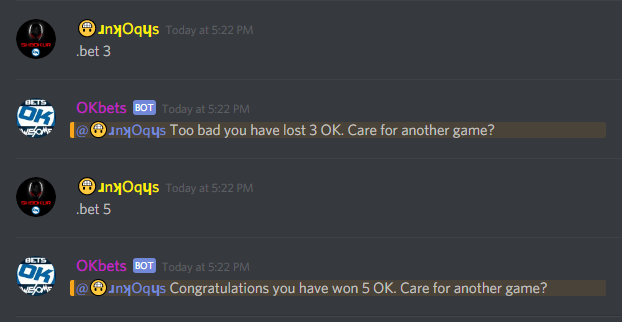 Created by Gapjusting, OKBets is the most used bot on the server. It allows you to use the bot and server to stake your OKCash in its staking pool, gamble, invest your OK in the house bankroll, trade your OK with the OKmarket and more. OKBets doesn’t stop with OKCash though. Recently, the creator of OKBets has added Bitcoin to bot. That way, you can deposit Bitcoin and use them for various things. You can buy OK from the OKmarket, tip other members, gamble your BTC and invest your BTC in the house bankroll. The gambling system is provably fair with a channel to show the hash result and is a 49.5–50.5 chance of winning. While you invest your BTC and OK in the house bankroll, as stated earlier, you can win more BTC or OK, but where you can win something you can also lose something so be careful and use at your own risk. When someone bet, and win the bet, the currency that has been betted is taken away from the bankroll and the investment everyone putted in is split evenly. 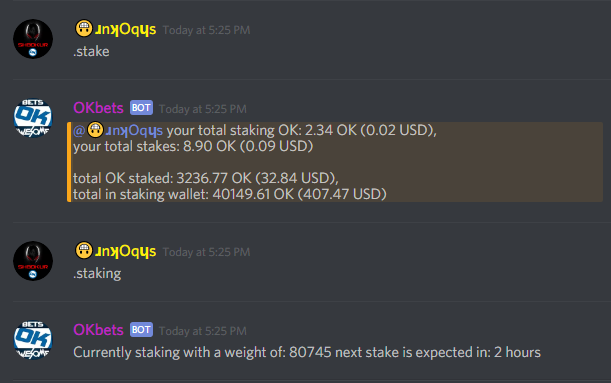 What’s for OK, when you invest, you are also staking at 0% fee, which can be a benefit if you don’t lose anything from people winning bets. 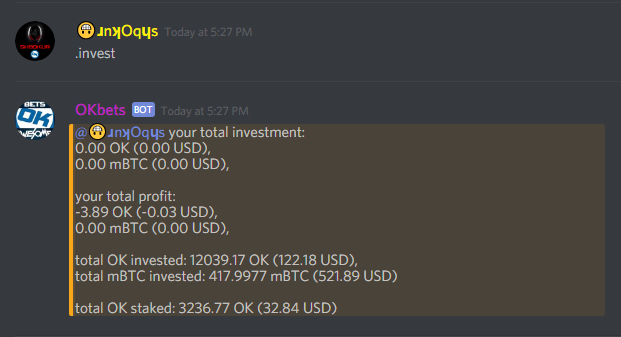 When you stake your OK on the bot, you accept a 1% fee, except for investors. The OKmarket is a trading platform within OKBets that allows everyone to sell their OK for Bitcoin or buy their OK with Bitcoin at any price they want. 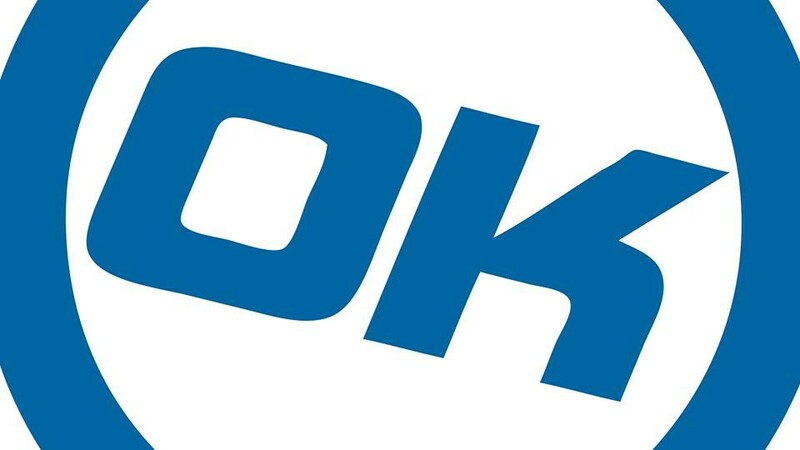 To sell OK on the BTC/OK market, you need OK in your balance and then you can use the command to sell your OK at a fixed BTC price in satoshi. If you don’t want to sell your OK for some reason, you can cancel your order(s) at any time… Unless someone already bought your coins. The market also allows you to buy OK with the BTC you have in your balance, and like with OK, if you don’t want to sell your BTC for OK, anymore or change your BTC/OK buy value, you can cancel it, and put another buy order. If you are new to OKCash, it’s a good time to visit our discord server and have some fun with Okcash and Bitcoin bots and trade some OK at the same occasion 😉.